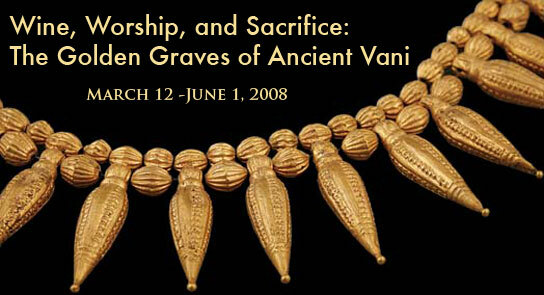 Wine, Worship, and Sacrifice: The Golden Graves of Ancient Vani was the inaugural exhibition at the Institute for the Study of the Ancient World at New York University. It features spectacular finds from four graves excavated at Vani, a major administrative and religious center of ancient Colchis (present-day Republic of Georgia) and the setting for the myth of Jason and the Golden Fleece. More than 100 objects from these graves, which date from the fifth and fourth centuries BC, are on display and include an impressive array of locally produced jewelry as well as imported goods from its Greek and Persian neighbors. Together, these objects create a clear picture of Vani as a crossroads city, providing compelling testimony to the complex interrelations that occurred in this region throughout its rich history.